Prominent & Leading Wholesale Trader from Mumbai, we offer ap23170, ap23341, ap23682 and ap89341k. · Optional 16ms or 65us selectable debounce time. · RST pin set HIGH to stop the playback at once. · LVD ( Low voltage detect). 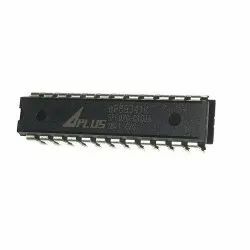 · Programmable outputs pin out1 - for busy-H , busy-L , stop-H , stop-L , prog busy-H , prog busy-L , Load, LED flash ( LED high active ) , ~LED flash ( LED low active ). · 2V – 5V single power supply and < 5uA low stand-by current. · 16/8/4 level volume control setting available. · 16 bits audio out. · PWM Vout1 and Vout2 drive speaker directly. · D/A COUT pin drives speaker through an external BJT or audio AMP. · Development System support for voice compilation. 682/341/170/85 sec Voice Length at 6KHz sampling and 4-bits ADPCM compression. Combination of voice blocks to extend playback duration. User selectable PCM16 or ULAW8 or PCM8 or ADPCM4 data compression. · Key Mode : S1 ~ S8 to trigger up to 57 voice groups; Power on play function. · SBT Mode : SBT to trigger up to 1024 voice groups sequentially; Power on play function. · CPU Parallel Mode : S[8:1] services as 8-bits address to trigger up to 256 voice groups. with SBT goes HIGH to strobe the address bits. · SPI Mode : CSB , SCK , DI. 3 wire address control up to 1024 voice groups. · I2C Mode : SCK , DI. 2 wire address control up to 1024 voice groups. · MP3 Mode : S1:Backward , S2: Forward , S3: (Pause/Stop) , S4:Reset , SBT: (Play/Pause) or (Play/Stop) Trigger up to 1024 voice groups. · aP89 Mode – Function setting similar aP89341/aP89170/aP89085. · Voice Group Trigger Options: Edge / Level; Hold / Unholdable; Retrigger / Non-retrigger. · LVR ( Low voltage reset ). · Programmable outputs pin out1,out2,out3 : for busy-H , busy-L , stop-H , stop-L , prog busy-H , prog busy-L , Loadbit, LED flash ( LED high active ) , ~LED flash ( LED low active ). · Three kind oscillator: Internal-Rosc External-Rosc Crystal.